Glide dental floss is one of only a few dental floss packages to come in a 40 meter length. Most flosses and tapes come in 25 meter lengths, half that of Glide. The only other tape with a 40 meter length is Blaque dental tape. Of course, having 40 meters of dental floss doesn't make the floss any better - BUT YOU ARE GETTING almost DOUBLE THE AMOUNT for your money! Basically, the packet just lasts twice the length of time as a normal packet of floss. But there's more to Glide dental floss than just being twice the length of others! The main difference with Glide floss compared to other dental floss is that it is extremely slippery. When you have teeth that are tightly packed together, in tight contact with each other, it can be very difficult to get floss between them. But Glide dental floss is probably the easiest of them all to get through tight teeth. Why is Glide so slippery? The fibers that Glide dental floss is made from contain PTFE, a very slippery, non-stick material. This means that it really does slide easily between even the tightest teeth. In addition, Oral B add a thin wax coating which also helps. Glide is also quite resistant to shredding, which can be a major pain for some people. When dental floss shreds between 2 teeth, you can spend most of the rest of the day trying to get the fine shreds out! It's really annoying! But when Glide dental floss snags between 2 teeth, it usually just snaps cleanly. NO SHREDS! So this extra shred resistance is a good feature of Glide. To be honest, I don't think it's quite as shred resistant as Blaque dental tape, but to be fair the Blaque product is also a little thicker. 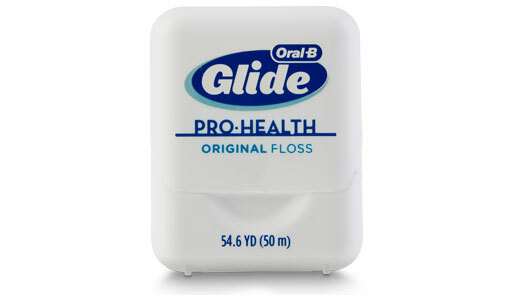 There are several versions of Glide floss, which is now owned by Oral B. They are all good, but I recommend the simplest one, the "Deep Clean" in Mint flavor.. The floss is a little thicker than you might expect, but is very soft. The package it comes in is pretty much a standard floss box, but occasionally the floss can be wound into the box very tightly, making it a bit more difficult to pull out. Here's a link to get the best value deal - a 6-pack from Amazon! Once you have pulled out your 18 inch section, you will find that it wraps around your fingers quite easily, because it is so soft and of a decent thickness. (Some thinner flosses can cut into my fingers a bit.) It has a nice feel to it. Then, when you go to put the Glide between a couple of teeth, you will probably notice straightaway that it slips pretty easily between them. If you're used to struggling with floss, this will come as a welcome surprise! BUT there is a downside to this slippery customer. Just as it slips into place so easily, it can also slip out again! This can be a little annoying at first, as it seems to pop in and out of it's own will. But with a little practice, you get used to this, and change your flossing technique a little so that the floss stays in place until you're ready to remove it. Because it's white in color, it can be a little difficult to see exactly where it's going, unless you have a good light. This is where a grey or black floss such as Blaque has an advantage, but it's not a big deal either way. Finally, the super-slippy surface of Glide floss has one other possible disadvantage; because it's so slippery, it may not "catch" as much plaque as other flosses. But this is a minor point; Glide dental floss will appeal to those people who would not otherwise floss at all, due to difficulties getting floss between their teeth. There is a good run-down of all the dental floss products available from Oral B at Oral B floss. The only thing I don't like about it is that there's no clear explanation of the differences between the various versions of Glide dental floss. To me, they just seem to have different colored packages and different names. That's why I recommend the "original" version, as shown above in the photo.